A research-based leadership growth tool that describes what it looks like to improve one’s practice as an instructional leader from novice to expert. Many principals and coaches are familiar with our 4 Dimensions of Instructional Leadership™. This framework describes the essence of effective instructional leadership — the work principals must do to improve instructional practice. The 4D Instructional Leadership Growth Continuum helps principals move towards this goal and describes what leadership behaviors look like at varying levels of expertise. Moving from novice to emerging, accomplished and expert, each level of practice describes the appropriate leadership behaviors for each dimension and subdimension. 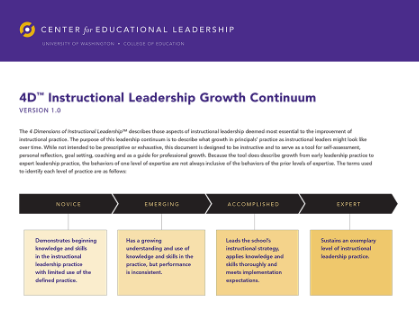 View a two-page sample of the 4D Instructional Leadership Growth Continuum. The tool is useful for anyone who is interested in improving a principal’s practice. It is designed for self-assessment, personal reflection, goal setting and as a guide for professional growth — it’s not intended for evaluation. The 4D Instructional Leadership Growth Continuum gives principals a road map for their personal growth journey in instructional leadership. It shows you where you are in critical aspects of your practice and offers more specificity on how to move to the next level.